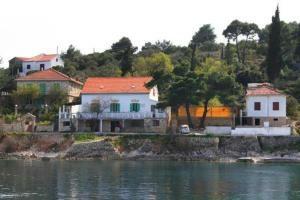 Set just steps away from the sea, Studio Riva is a self-catering accommodation situated in Hvar. Featuring a shower, private toilet also comes with a hairdryer and towels. A grocery shop and the local marketplace are both located at a distance of 150 metres. The Bishop's Castle and Hvar's Theatre and Arsenal are both more or less 200 metres away. The Ferry Harbour in Stari Grad presents lines to not far away islands and to the town of Split. Studio Riva ~0.1 km, Hvar price per day from € 50 Set just steps away from the sea, Studio Riva is a self-catering accommodation situated in Hvar. Featuring a shower, private toilet also comes with a hairdryer and towels. A grocery shop and the local marketplace are both located at a distance of 150 metres. The Bishop's Castle and Hvar's Theatre and Arsenal are both more or less 200 metres away. The Ferry Harbour in Stari Grad presents lines to not far away islands and to the city of Split. Heraclea Residence ~0.1 km, Hvar Featuring gratis wireless internet access, Heraclea Residential Apartments is located in a historical building less than 50 metres from the Adriatic Sea. In this sophisticated apartment visitors will find elegant furnishings as well as air conditioning, a sofa and a lcd tv with cable channels. The kitchen in the apartment provides guests with a refrigerator, a cooker and a dishwashing machine. Paid public car parking is available near the apartment. Riva Hvar Yacht Harbour Hotel ~0,1 km, Hvar This boutique hotel is set on the most famous promenade in Hvar and presents views of the dynamic Hvar yacht marina. Its' designer air-cooled rooms take inspiration from the Hollywood glamourous way of life. WiFi is included free of charge. All of the air-conditioned rooms at Riva Hotel have individual themes. The spacious en suite restrooms feature fluffy gowns and designer touches, while other facilities include a lcd tv and a mini bar. The one-of-a-kind boutique hotel experience continues on the outdoors terrace where visitors can enjoy elegant gastronomic delicacies intermingled with cutting-edge cocktail creations. Milna (Hvar) ( ~ 4.2 km ): 46+ apartments. Brusje ( ~ 4.7 km ): 6+ accommodation units. Stari Grad ( ~ 12.9 km ): 247+ apartments. Beach Momo, Hvar ~ 0,6 km from Studio Riva Gravel beach: ideal for families, recommended for young people, with restaurant, with caffe bar, equipped with showers. Excellent choice of watersports. Beach Jerolim ~ 1,3 km from Studio Riva Rocky beach: with restaurant, with caffe bar, equipped with showers. Excellent choice of watersports. Nudism is allowed. Beach Mala Garska ~ 2,3 km from Studio Riva Concrete beach: ideal for families. Beach Pribinja ~ 2,3 km from Studio Riva Gravel beach: ideal for families. Beach Mekicevica ~ 2,4 km from Studio Riva Rocky beach. Nudism is allowed. Restaurant Mustaco , Hvar Guest reviews: 7,2/10 ~ 1,4 km from Studio Riva Address: Pokonji dol, 21450, Hvar. Restaurant Pizzeria Mama Leona, Hvar ~ 0,6 km from Studio Riva Cuisine: Pizza. Restaurant Buffet Pizzeria BEPO, Hvar Guest reviews: 8,4/10 ~ 0,9 km from Studio Riva Address: Krizna luka bb, Hvar. Restaurant Lungomare Hvar, Hvar Guest reviews: 8,5/10 ~ 0,6 km from Studio Riva Address: Veljka Kovacevica 20, Hvar. Cuisine: Croatian cuisine. Restaurant Vartal, Hvar Guest reviews: 8,4/10 ~ 0,4 km from Studio Riva Address: Fulgencija Careva 1, Hvar. Cuisine: Croatian cuisine.